The Swim and Tennis Clubs. Once the Palm Coast Swim and Tennis Club were completed they were added to the 'Guided Tour'.The at first White then later Palm Coast Blue Tour Vans would depart the Welcome Center 'Exhibit Area' and loop through, in and around this area for the prospective buyers to see. In the early Tours, the white and then also blue vans departed the Welcome Center 'Exhibit Area'. to 'tour' the original Core Areas of Homes in the first Neighborhood of Palm Coast. They looped in and around the original core area of the first neighborhood passing by the First Childs' and Neighborhood Park on Cooper Lane. After the Golf Clubhouse 19th hole was completed it was added to the Tour. After the Palm Coast Swim and Tennis Clubs were completed they were added to the full 'Guided Tour'. 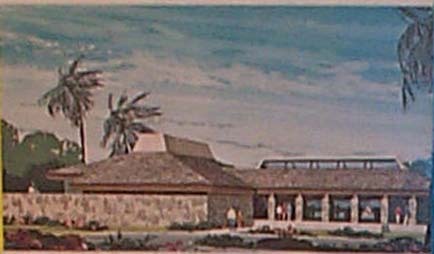 This is a picture of the '...Architect's sketch of yacht club scheduled for completion in 1973...'. It is from AD 2241 - Palm Coast is a planned community by the ITT Levitt Development Corporation, a subsidiary of ITT Levitt and Sons, Incorporated, another worldwide service of the International Telephone and Telegraph Corporation. Marina/MarinaComplex/Resort # 2 we once had for decades last Century. Picture below is this Century. Later the Palm Coast Marina a.k.a. 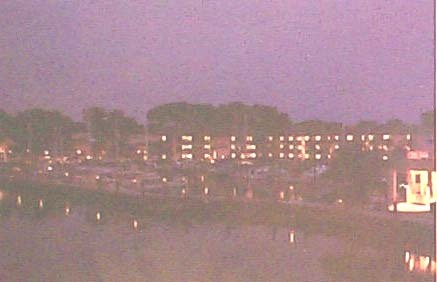 Yacht Club, Boat Slips, and Sheraton; early evening circa 1988. You can see the outline of many TALL , MASSIVE, Oak Trees that were there forming a gorgeous cooling canopy as you went in and around the other Sheraton we once had. This was all replaced by development. 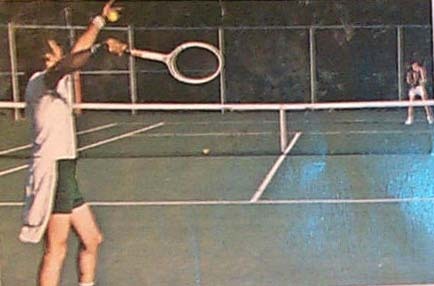 Picture of the Grand Opening for the Tennis Club Complex took place on May 15, 1978. '...Four additional tennis courts have been completed at the Palm Coast Tennis Club adjacent to the Yacht Club, giving area tennis buffs six courts with which to pursue their favorite sport. The Grand Opening for the new complex took place on May 15. The featured event was an exhibition match between tennis pros Tom and Tim Gulikson. Washington Tennis Service, a tennis management firm oversees the new tennis complex and provides a tennis professional. The tennis pro works with the Palm Coast Tennis Association and has developed a complete tennis program which includes video tape coaching sessions, intraclub competition, tennis clinics and other special events. The Washington Tennis Service specializes in all aspects of tennis and tennis club management and stocks the new tennis shop with the latest equipment, clothes and other accessories. The Tennis Shop, which also serves as the tennis pro's office is a gazebo located between two of the tennis courts. The Tennis courts have been specially designed, using a plexicushion surface over an asphalt layer. The plexicushion provides better bounce and playability. It is also more durable than standard tennis surfaces and less fatiguing for players. All six tennis courts have been lighted for night play, and twenty-four metered lights have been installed. Four quarters will turn on the lights for an hour, providing four sets of lights for each court. The Tennis Courts located here were replaced by development. Excerpt from: The Palm Coaster, Summer 1978. Volumn 7, Number 2. The Palm Coaster is published by the Corporate Communications Department of ITT Community Development Corporation for Palm Coast property owners, purchasers and homeowners, as well as their families and friends. This view is at the intersection of Clubhouse Drive and Palm Harbor Parkway. 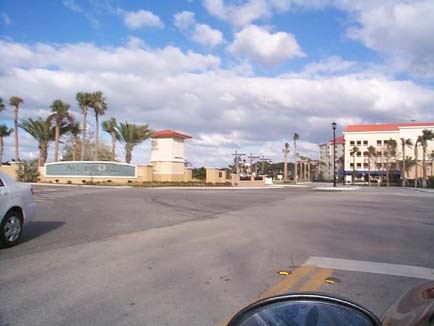 ( Palm Harbor Parkway was formerly known as J. Norman Young Parkway but now it is Palm Harbor Parkway again). This picture is the present Palm Coast Resort by Centex. 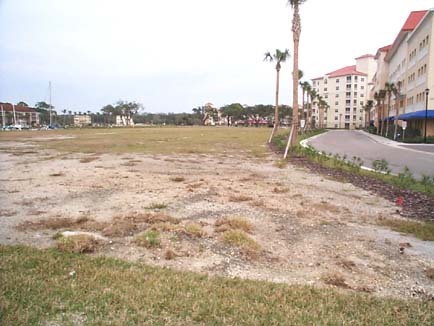 This Development now replaces the area where the once beautiful Palm Coast Yacht and Swim Club, and Tennis Courts were located. The locations are for the Palm Coast Yacht Swim Club is where that big grass spot exists now to the left of the big beige/tan parking garage. This Parking Garage replaced just about where the first beautiful public Tennis Courts were. There were once many massive and Majestic picturesque Large Oaks there enhancing the area. Bath Tub Boat Races that used to be held here. Let the Bath tubs begin....! They were WET and alot of FUN! The Great Palm Coast Bicycle Race used to be held here. Please note the sign behind the starter to indicate the starting point. This was the first Public Boat Ramp with a 6' Cyclone Fenced gates; now most probably part of the Palm Coast Resort. 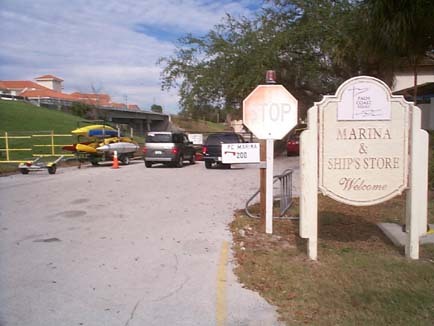 The first Marina and Ships Store and the Boat Ramp we once could use in Palm Coast still remain just adjacent to the tall Cyclone Fence - now labelled...NO TRESPASSING. An 80 Slip facility in a protected harbor with overnight dockage for boats up to 0 feet long. 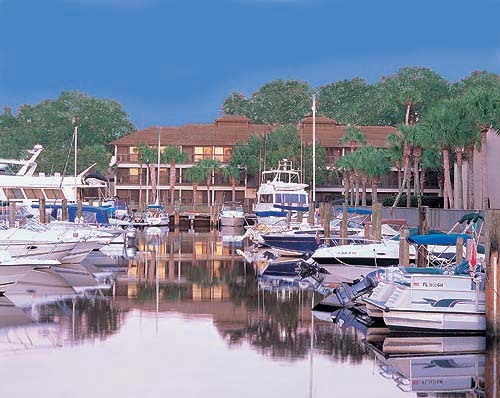 The The Yacht Club features an excellent restaurant and swimming pool. Ship Store, complete with ice, soft drinks, beer and wine.